B & H Engineering, P.C. 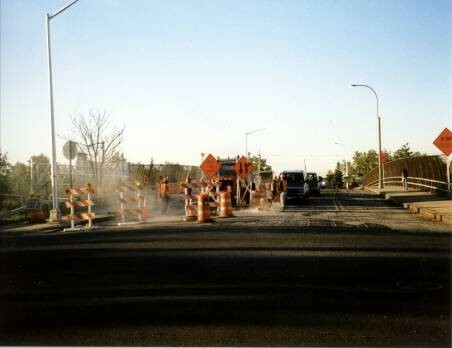 has provided construction inspection services, as a prime consultant, to the New York State Department of Transportation on the Maintenance repair of 14 bridges on Throgsneck Expressway, Bruckner Expressway and Bronx River Parkway in the Bronx County, New York. The Construction inspection services consisted of providing field inspections, monitoring work zone traffic control, coordination with NYC agencies, other contractors, and utilities; reviewing contractor's schedule, equipment, and staffing; processing payments and change orders; and maintaining office records. The work for this project included removal of debris and vegetation; removal of graffiti; concrete repairs to piers and abutments; embankment and stabilize with concrete; replacement of settled sidewalks; fill-in eroded and undermined areas; repair concrete cracks; remove hollow concrete areas; patch concrete spalls; clean and reseal joints; repair netting supports and remove and replace netting; remove asphalt wearing surface; replacement of steel bearings; tighten loose nuts on bearing anchor bolts; spot paint structural steel; investigate utilities and repair or replace supports; removal and replacement of deteriorated brick veneer; clean and reseal masonry joint with mortar; remove and reinstall masonry stones; application of sealant to new concrete; application of epoxy coating; replacement of clamps on bridge rail; replacement of chain-link fence; and install new lamp posts.